KirbyKaze is a professional Canadian Melee player from Markham, Ontario (born in Thornhill), regarded as the best Sheik player from Canada and one of the best Sheik players in North America, along with Mew2King, Plup, Shroomed, and Swedish Delight. From 2010-2012, he was a top 8 player in the world and recorded the best results of his smash career to date, going head-to-head with USA's best, defeating Mango and PPMD at Revival of Melee 3 and Hungrybox at Apex 2012. KirbyKaze is currently ranked 29th on the 2017 SSBMRank and was formerly ranked 1st on the Ontario Melee Power Rankings. After taking a small break, KirbyKaze marked his return to Smash in 2014 by placing 4th at Get On My Level 2014. He has since seen strong results, notably SWEET Prologue which he won, and Apex 2015 where he took 7th. He had an unexpectedly low 97th placing at EVO 2015. 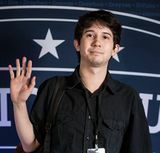 In December 2015, KirbyKaze announced that he was retiring; however, he has since come out of retirement, attending more tournaments and netting impressive placements such as 9th at The Big House 6 and 4th at Canada Cup 2016. KirbyKaze is the first non-American smasher to have been signed by Melee It On Me, as he is Canadian. This page was last edited on January 14, 2019, at 00:40.